When it comes time to learn about the addition properties, the distributive property is probably the most confusing. 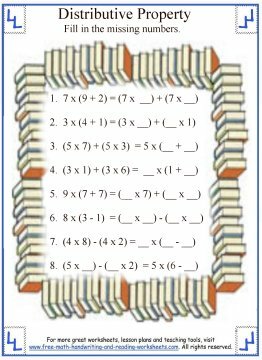 It builds upon the ideas learned with the associative and commutative properties as well as the partial products concepts. 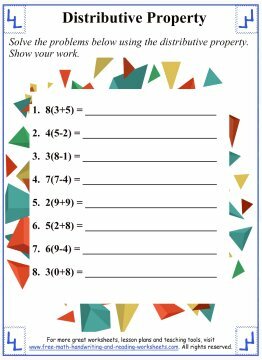 Below are a few worksheets that you can download and print out for personal or classroom use. Simply click on the picture and you will be taken to Google Docs where you'll find a printable PDF file. Each worksheet has instructions on it, but I thought it may helpful to cover them here as well. In the first paper your child is shown an equation. All your child needs to do is re-write the problem using the distributive method. If you're feeling really mean, you could make them solve it too. In the example at the top of the worksheet, I've shown how to write the new problem (and solved it), but all we're focusing on in this lesson is using the property. The second activity sheet is the same basic idea, except your child just needs to fill in the missing numbers. Again, the focus is not on solving the problems as much as it is understanding how the two equations are the same. It's time to get serious in the third printout. 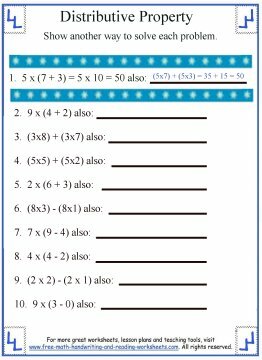 In this activity, students need to solve each problem using the property and as always...show their work! That's it for now, be sure to check out the related math lessons below. As I mentioned earlier, this lesson builds upon the material I covered in the partial products worksheets and associative/commutative lessons.